Good things are happening at Masbia’s new site with more on the way. The food pantry is up and running at 105-47 64th Road, Forest Hills, on Thursdays from 2 to 5 p.m. The section to have dinner guests should be finished in the near future. Holiday meals were dispensed in Queens this week by Masbia, a nonprofit pantry and soup kitchen network, NY1 reported. The meals were dispensed outside the soup kitchen’s former location at 98-08 Queens Boulevard. Although Masbia lost its lease and was forced to close over the summer, volunteers still wanted to give hot meals to the needy. Masbia Soup Kitchen volunteers served up some holiday meals on the street in December. On Monday, the Jewish non-profit handed out hot kosher meals while outside their former home. The kosher meals were previously made at 98-08 Queens Boulevard, Rego Park, before their lease ended. The Masbia Soup Kitchen in Rego Park got some help from a realty firm last week. According to Alexander Rapaport, co-founder and executive director of the Masbia network of kosher soup kitchens and food pantries, Stanley Schuckman of Schuckman Realty held a coorporate volunteer day at the all-kosher facility. Not only did he provide the labor for the meal that night, he also distributed cash for everybody who dined in the kitchen that day. 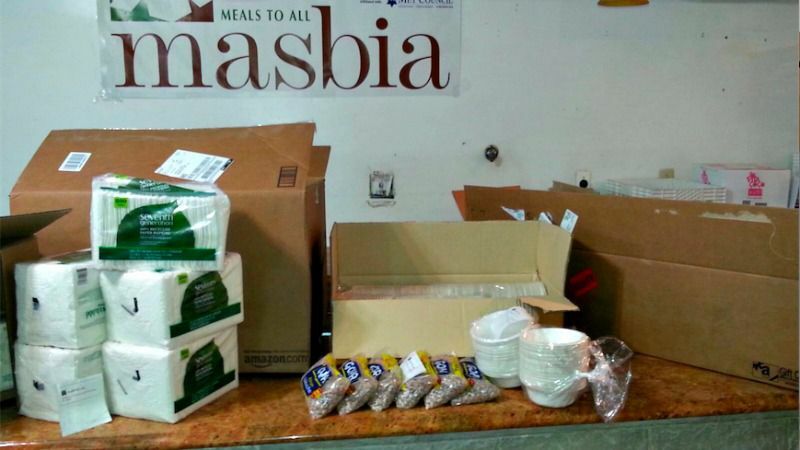 The Masbia Soup Kitchen specializes in supplying kosher goods to homeless residents across Queens and Brooklyn. Their kitchens serve hot meals five days a week and provides a pantry program during Passover. This consists of nine meals for the eight days of the Jewish holiday during which Masbia does not operate. It looks like a construction zone right now but this empty storefront in Forest Hills is undergoing a transformation. "We're very excited about the new location,” said Alexander Rapaport, the executive director of the Masbia Soup Kitchen Network. "We're also very excited about the fact that it has more space." Masbia is currently operating out of this location in Rego Park on Queens Boulevard, where they've handed out more than a million kosher meals since 2009. NEW YORK - Masbia soup kitchen is reporting a severe food shortage, warning that needy families will receive just the barest basics for this weekend’s food packages. “Sadly, the only protein that families who rely on Masbia will be getting in this weekend’s food packages will be dry beans,” said Alexander Rappaport, Executive Director of Masbia, in an interview with Hamodiaon Thursday. Yes, Masbia is looking for a new space in Queens. But first, how about more plates and napkins? Masbia Soup Kitchen Network , the New York organization that feeds the needy in a dignified, restaurant-like setting, may soon be displaced from at least one of its three locations. Gone are the days when soup kitchens were located primarily in lower-income neighborhoods, served only soup and, perhaps, a piece of bread, and conjured images of the Great Depression, with hungry, winter-coated men and women waiting in long lines on snow-covered sidewalks. Case in point: the Masbia Soup Kitchen Network, which was founded just under a decade ago and opened its latest location, its third, at 98-08 Queens Blvd. in Rego Park in March 2010. Tucked inauspiciously between a pharmacy and an Indian seafood restaurant, the kitchen could easily be mistaken for just one more restaurant in a neighborhood that overflows with eating establishments. At the Rego Park location, diners are greeted by a casually dressed maitre d’-like figure who asks them to sign the guest book at a small kiosk before showing them in. On Sept. 23, City Council Speaker Melissa Mark-Viverito, second from right, joined Councilmembers Karen Koslowitz, Rory Lancman and Mark Weprin at the Masbia soup kitchen at 98-08 Queens Blvd. in Rego Park to help provide hot meals to those in need. NYC Council Speaker Melissa Mark-Viverito will visit Tuesday afternoon Masbia Soup Kitchen in Rego Park, Queens, to prepare food and serve meals to hungry New Yorkers celebrating the Jewish New Year holiday of Rosh Hashanah. The packages will contain “LEPESHKA” Bukharian Jewish round challah bread for Rosh-Hashanah, honey, raw chicken, carrots for Tzimmes and much more, according to Masbia head Alexander Rapaport. On a recent chilly afternoon in Queens, two women shivered in a line of about 50 people that trailed out the door of Masbia, a kosher food pantry and soup kitchen. The first woman, from Manhattan, wore baggy pants. The other, from Queens, was clad in a long, draping skirt. Their outfits signaled differences in how they interpreted proper Jewish dress for religious women, but both were there for the same reason: They needed kosher groceries, which are more expensive than average, as they try to live on less since food stamp reductions last November. Residents living in the four Pomonok Houses buildings without cooking gas got an unexpected surprise when a Brooklyn van pulled up last week with a hot meal for all. Up to 1,000 residents in 259 apartments had their stoves turned off two weeks ago after a defective gas line was discovered. Tenants were given two-burner hot plates by the New York City Housing Authority, which runs the 35-building complex in Flushing. The gas may be out, but at least they’re not starving. Queens soup kitchen Masbia is giving a ladle up to the New York City Housing Authority residents who lost their gas at the Pomonok Houses in Flushing earlier this month. REGO PARK, QUEENS -- State Assemblymember Andrew Hevesi and State Senator Joe Addabbo recently took a tour of Masbia Soup Kitchen, the only Kosher soup kitchen in Queens. Masbia, on Queens Boulevard in Rego Park, opened in March with the help of Henry and Susie Orenstein via the Metropolitan Council on Jewish Poverty, and it is already serving more than 120 people a day, five days a week. Every Thursday, clients – mostly local seniors and families with children – are given weekend packages of cooked and raw food to take home.